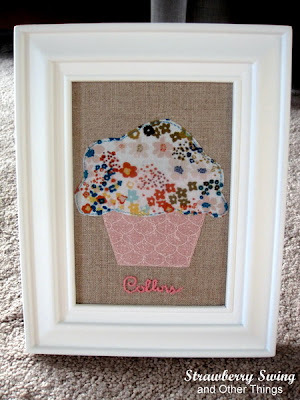 As soon as I came across this little applique frame on pinterest, I knew I wanted one for myself. Problem is, child decor doesn't really fit into a house of 2 adults. Instead, I thought, maybe I could make my own version and use it as a gift. My friend was due at the end August (and this was back in June), I knew her nursery "theme" was cupcakes and figured that would be the perfect (and hopefully easy) way to try out something new. You see, I have very little sewing ability outside of a button... and even that I hate doing. First I found my fabric. 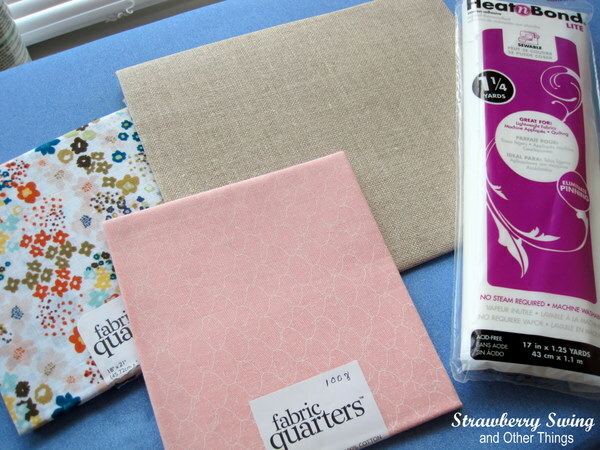 I bought two of the little quarter squares at Joanns. They had a ton of options and basically looked like enough fabric for a bandanna - which would be more than enough. 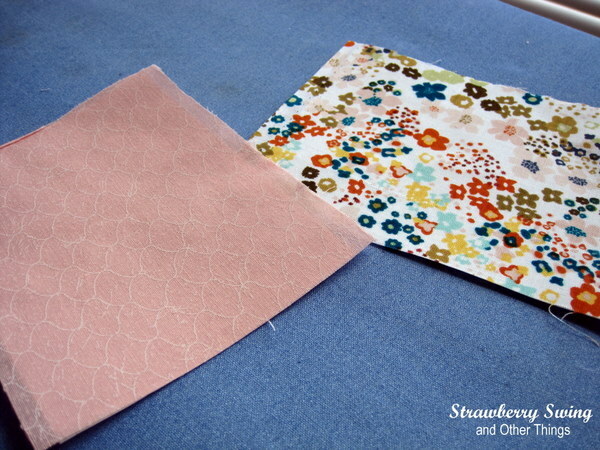 I grabbed two coordinating fabrics that I knew would go with her blue and pink nursery. 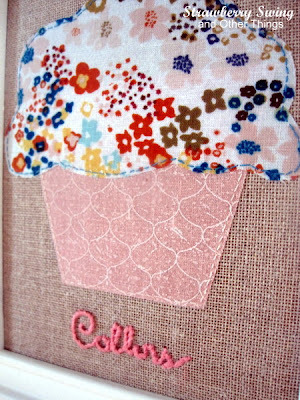 I also liked that the floral print sort of mimicked sprinkles. 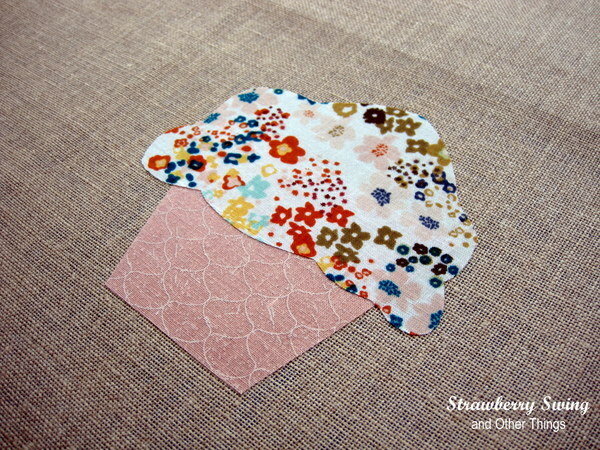 I also grabbed heat and bond transfer paper, and linen embroidery backing. 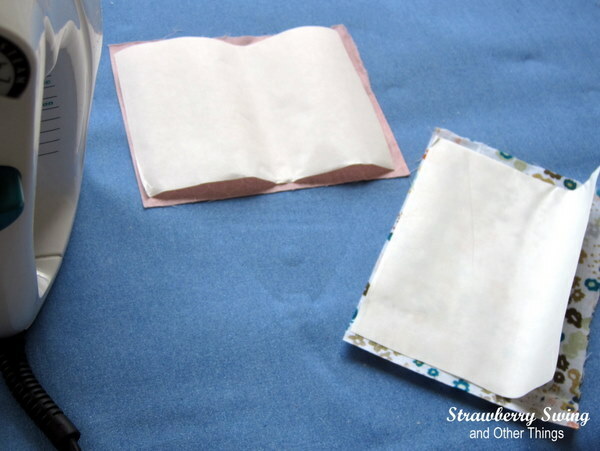 I cut two squares of fabric and two squares of iron transfer paper and attached them following the directions on the Heat and Bond packaging. 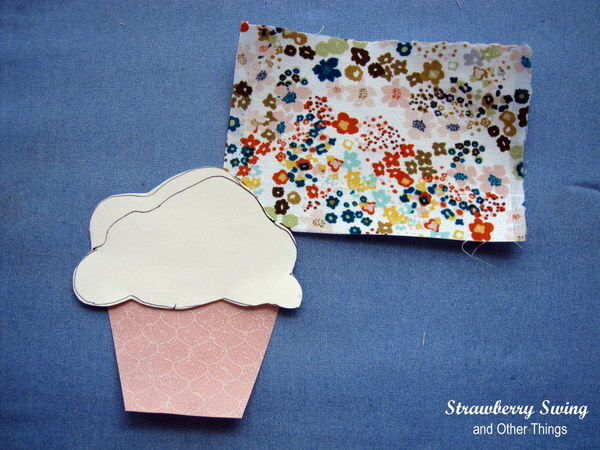 Once on, I free handed a cupcake stencil, in 2 parts, the cup and the cake on construction paper. Once satisfied, I cut out my template and I then transferred that to iron on transfer paper (the back side) and then cut out my shapes. 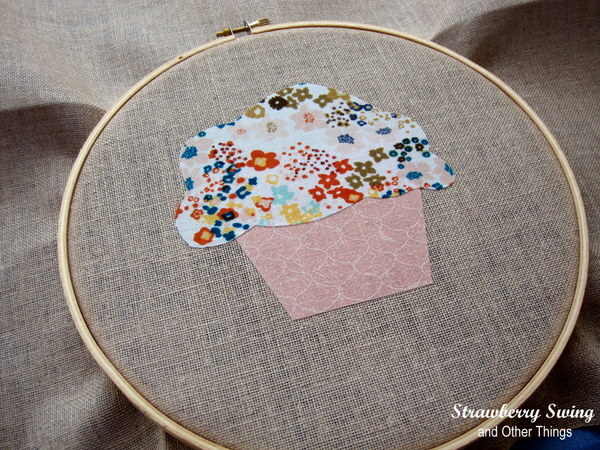 After my "cup" and my "cake" were cut, I planned the placement on the linen backing. 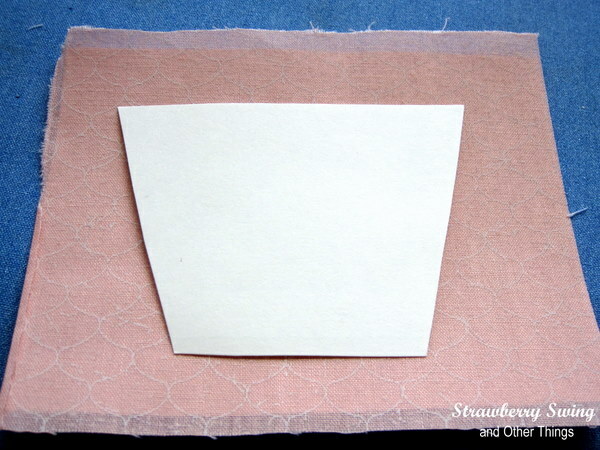 Removed the second layer of paper from the iron on transfer and bonded the fabric to the linen per the instructions given. 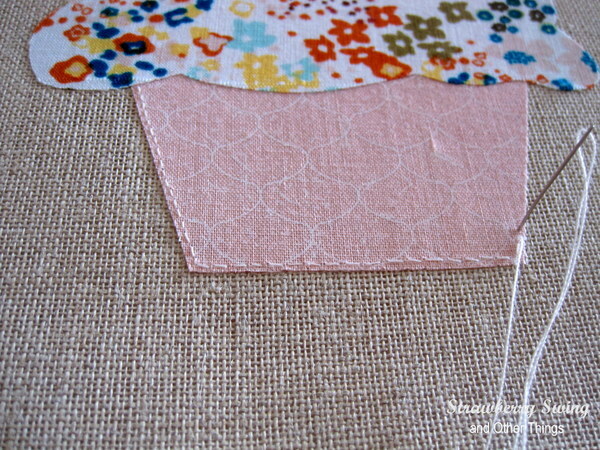 After this, I placed the linen in an embroidery hoop so I could stitch and outline around my little applique. I'm sure if you have a sewing machine, and/or actually know how to work one, this step would be easy peasy.... instead I did it by hand, taking my time to make sure my stitches were roughly the same length and distance from the edge. I did the "cake" part in a contrasting blue so it would stand out a little more. 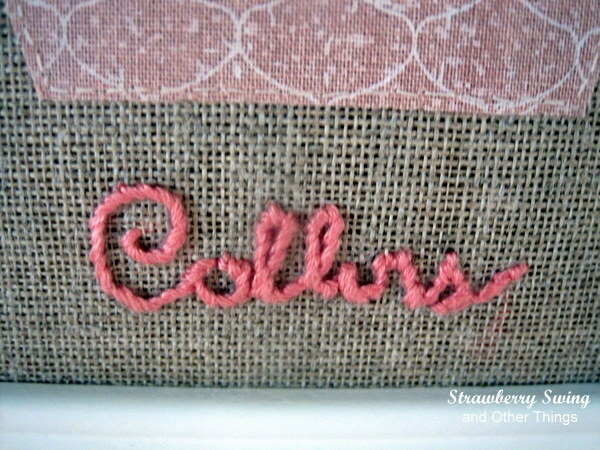 Instead of writing "hello" like the pinspiration picture above, I wanted to write the baby's name. Collins. It didn't come out perfectly, but not too shabby for being my first time.﻿ After I was done, I removed the embroidery hoop and ironed out the wrinkles. I searched high and low for WHITE 8x8 frame, preferably with mating, but I failed and I was running out of time. I grabbed a 5x7 white frame at Target and knew it would be a tight squeeze. Tip: Pick our your frame first before cutting your shapes to size! 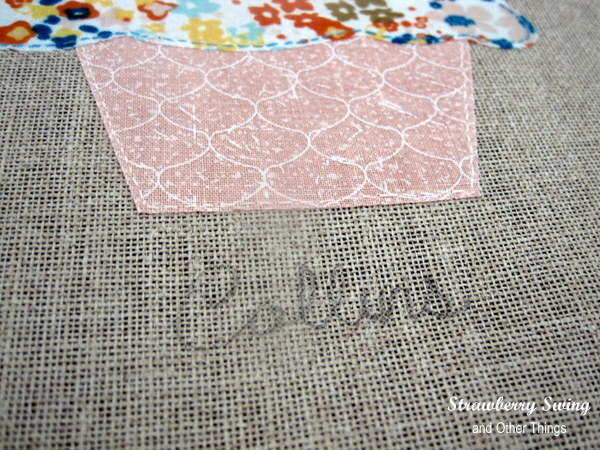 I cut the linen backing with enough extra that I could "wrap" the cardboard insert that came in the frame. To keep it pulled tight and in place, I stapled the fabric directly to the cardboard and and finished wrapping it just like you would a present. Here was the final product! After this picture, I decided to remove the glass, but put it in the back of the frame in case my frame would like it there. She was so happy to have received a handmade gift that was custom for her new little girl. I definitely hope to make a few more of these in the future! 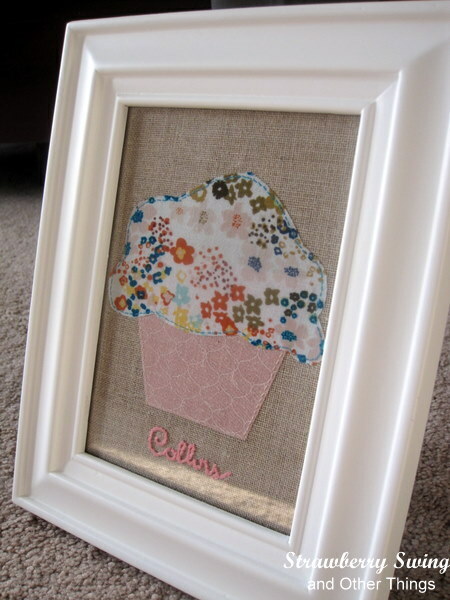 What kind of homemade gifts have you made in the past? I'm always looking for new ideas, please share! you are so creative love your re-creation! I LOVE it! It turned out so cute! I'm totally going to try this soon. Wow, I'm so impressed with your craft skillz!! This is really adorable. LOVE this! Super adorable and will be so special for them...handmade from the heart. Great job!! What a great project! I'm going to totally try this out for a friend who is expecting! This is such an adorable diy. This is so cute and sweet - what a fabulous gift!